The International Policing Award recognizes the important contributions made by Canadian police services in global matters. It acknowledges Canadian law enforcement personnel for their exceptional dedication and initiative in using Canadian policing skills to contribute to a safer world, and seeks to encourage more Canadian police services to contribute to and work on the international scene. Contributing outside of normal duties to a project that fosters Canadian values and projects a positive image of police in society. 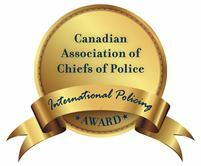 Nominations may be submitted by any active member of an accredited agency belonging to the CACP. references to the nature of the work done internationally and the role played by the nominee, as it relates to the award criteria. The complete award application package including all supporting material must be submitted to cacp@cacp.ca electronically (preferred method) or by mail to: Canadian Association of Chiefs of Police, 300 Terry Fox Drive, Suite 100, Ottawa, Ontario K2K 0E3. The Selection Committee consists of a sub-committee of the CACP International Committee. Every submission will undergo peer review by the Selection for eavluation and final selection. April 27th, 2019: Deadline to submit nominations.